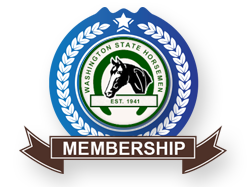 Membership matters and with Washington State Horsemen (WSH) there are endless possibilities from the weekend trail rider to the serious competitor and everything in-between. Within the three major divisions (Horse Show Division, Games Division, and Trails and Pleasure Division), there is a place for everyone at any level of experience. Included is a great Youth Merit Program for the junior members and they do not have to own a horse to be a part of this great educational program. Don’t own a horse, but really love them, join WSH, we have several members who are ‘horseless’ and they enjoy the friendships and common interests shared by our horse community. We keep members informed of any legislation that will affect our rights with regards to owning horses. There is strength in numbers and by joining WSH, a statewide association, we can make a difference! is for those of you who are not active in a WSH Club, just download and print the ‘Non-Club’ Membership application, complete it and submit with proper payment to the address included on the form. is for active members of one of our 100% or Affiliate Clubs, be sure to contact your Club Secretary directly to pay your dues. They will take care of sending your information to the WSH Secretary directly. Once your application is processed, a membership card will be mailed to you. The ‘Club Membership Form’ is to be used by Club Secretaries only.